^ (PDF) シリア「内戦」とイスラーム主義. http://www2.jiia.or.jp/pdf/resarch/H24_Arab_Spring/02-moriyama.pdf 2016年12月8日閲覧。. ^ Joscelyn, Thomas (2015年4月25日). 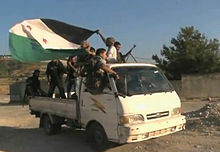 “Al Qaeda, jihadist allies declare victory over Syrian regime in key city”. The Long War Journal. http://www.longwarjournal.org/archives/2015/04/al-qaeda-jihadist-allies-declare-victory-over-syrian-regime-in-key-city.php 2015年4月25日閲覧. "In addition to Al Nusrah and al Qaeda-linked jihadist groups, fighters associated with the Free Syrian Army also took part in the battle."